Nick Lincoln lifts his 6-foot body from his wheelchair and eases behind the steering wheel of his van. The morning routine that previously took seconds now requires advanced planning. Glancing in the rearview mirror, Nick smiles as he locks eyes with his 19-month-old daughter, Sydney, buckled in her car seat. 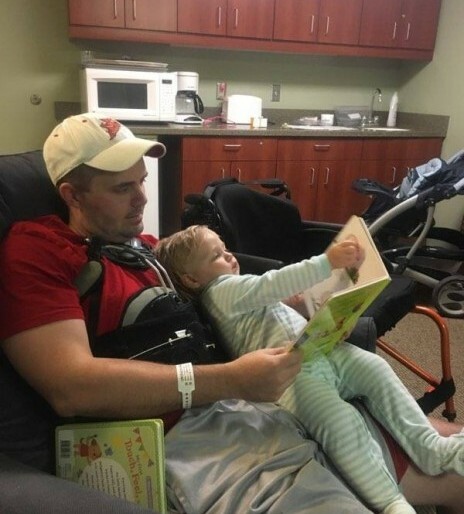 The toddler is the driving force behind Nick’s recovery from a paralyzing spinal cord injury. On August 2, 2018, Nick, of Webster City, Iowa, was riding his four-wheeler with close friends in the Wisconsin Northwoods. With daylight waning, the group accelerated to beat an approaching storm and as Nick crested the hill, his ATV rolled over and slammed into a tree. The impact crushed Nick’s spinal vertebra, causing a T7 burst fracture and paralyzing him from the waist down. Following an ambulance ride to Aurora Bay Care Medical Center in Green Bay and emergency spinal surgery, Nick healed and contemplated next steps. “I finally came to the realization that I can’t go back and change what happened,” Nick said. Two weeks later, Nick arrived via air ambulance to Lincoln. The initial days were exhausting. After losing his core strength, balance was a challenge. Sitting up caused his blood pressure to plummet. Undeterred, Nick stayed positive. “I have fully functioning hands and a brain; I’m past the point of regret.” A wooden block, a gift from a friend, engraved with the words “You Got This” reflects Nick’s attitude. The 34-year-old sales manager, competitive by nature, enjoyed reaching therapy goals. Mastering everyday living skills, like dressing and bathing, was a major achievement. “Between the nurses, therapists, doctors, counselor, I had 20-30 staff encouraging me; you have to trust the process,” Nick said. Visits from his loving wife, Whitney, and energetic daughter, motivated Nick to excel. Balancing Sydney on his lap as he finessed wheelchair maneuvers, or letting her push him, reassured the young father of his life role. Recreational outings to the archery range and practicing in the Paragolfer, an all-terrain wheelchair, were fun and inspiring. The driver retraining program restored Nick’s self-confidence to get back behind the wheel. Nick’s injury altered the way he lives, but it doesn’t define him. He’s back at work and making gains in local outpatient therapy. “My outlook on life changed greatly,” Nick said. It’s the little things, like the one in his backseat, that matter most. To learn more about Madonna's individualized approach to spinal cord injury rehabiltation, click here.